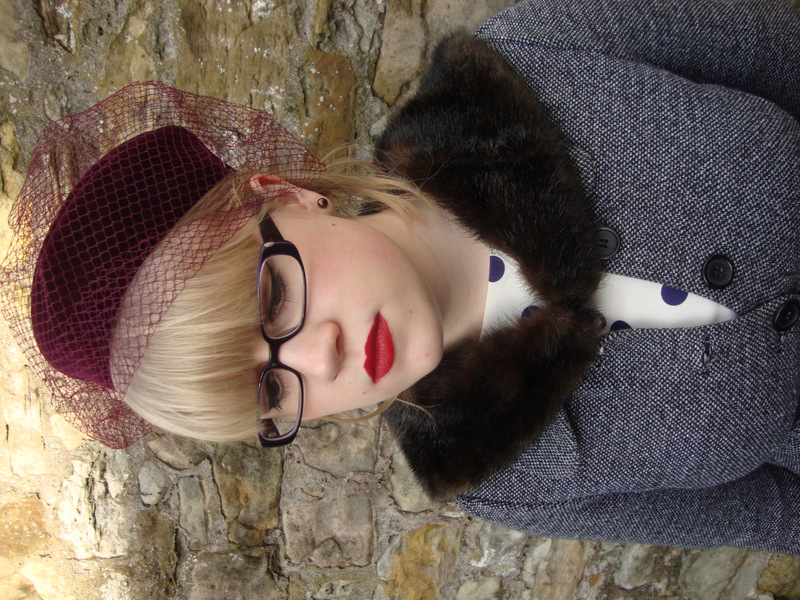 I spent this morning perusing the rails and playing dress-up at St Andrews Very Vintage Fashion Fair. Ivory Tower Events brought together a group of vintage sellers from all over Scotland to create a retro experience in Younger Hall. The Fair had a relaxed atmosphere and was intimate and well-organised, with a range of high quality vintage on offer. Vintage clothing stalls included The Frockery (who I was pleased to meet in person after chatting to on Twitter), the lovely Fox & Bhut ladies, Ruby in the Dust Vintage, CrossWood, Secret Wardrobe, and Scaramanga. The vintage sellers were really friendly and had cherry-picked stock for the event, which added an air of exclusivity. Ivory Tower really had thought of everything, with vintage-style cupcakes from the University of St Andrews Charities Committee and Ruby’s Cupcakes, as well as makeovers from Sandra Cormack of SC Makeup Artistry giving glamorous makeovers. A thoroughly retro experience! All in all it was a well-organised project and a great addition to the calendar of events here in St Andrews. We need more events like this and I hope it returns soon! I thought the £3 entrance was reasonable, given that it will cover their overheads, although others thought it was a little steep given the limited selection of vintage and the price of the vintage on offer. However, as I say the vintage was of high quality and priced accordingly; finding such pieces at a lower price would require extreme patience/ talent at bargain hunting/ sheer luck/ mad haggling skills so I appreciate the editing process that had been done in this scenario meant prices were a little higher. I did also see some absolute bargains so there were some budget vintage gems there too! I’ve been on the hunt for the perfect camel coat for a while now – there’s something so timelessly elegant about it, and the right shade of warm camel goes with almost everything. I spotted this one and had to try it on – the perfect feminine shape and classic hue. I thought this coat was beautiful and sat really well but I had to leave it behind: for a winter coat it was a tad on the small size for fitting bulky jumpers and layers underneath for the colder months. 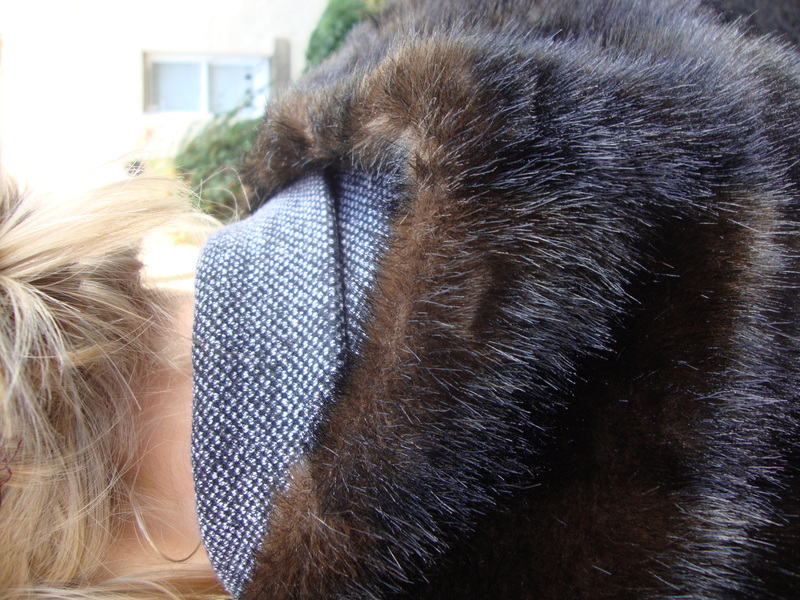 It was also £40 which was incredibly reasonable for a vintage wool coat in such great condition, but I am trying to watch my money at the moment and I couldn’t part with the cash knowing it was a tad on the small side for winter. It did go well with my outfit though; on that note thanks to the lovely ladies running the Cancer Research stall and their outfit compliments and pictures, I was extremely flattered (haven’t seen the pictures yet but they should be on their website). That brings me to my outfit. I haven’t had the excuse to dress “full on” vintage for a while so I thought I may as well get my retro gladrags on today! 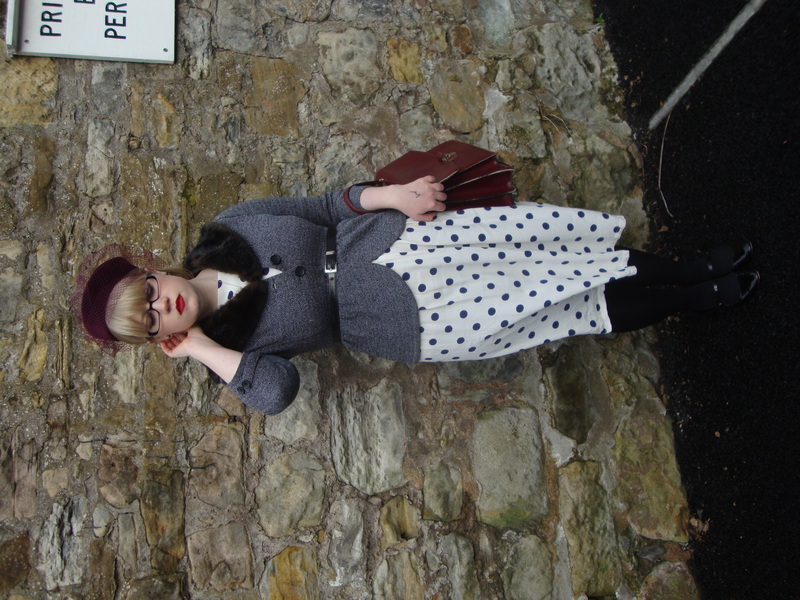 I went for a glamorous ’40s-inspired outfit today which actually (shock, horror!) was almost entirely high street with a few vintage accessories! I know the philosophy of mixing one-off vintage finds with high street separates is hardly new, but I really liked this outfit and received lots of compliments, so thought I would share it with you. 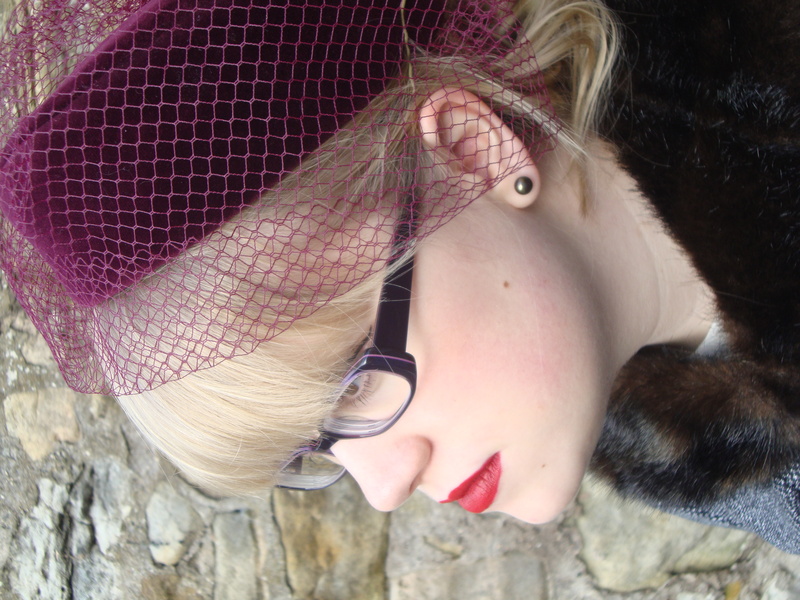 The vintage velvet and net hat is a favourite of mine, found in Edinburgh’s vintage treasure trove, Armstrong’s. 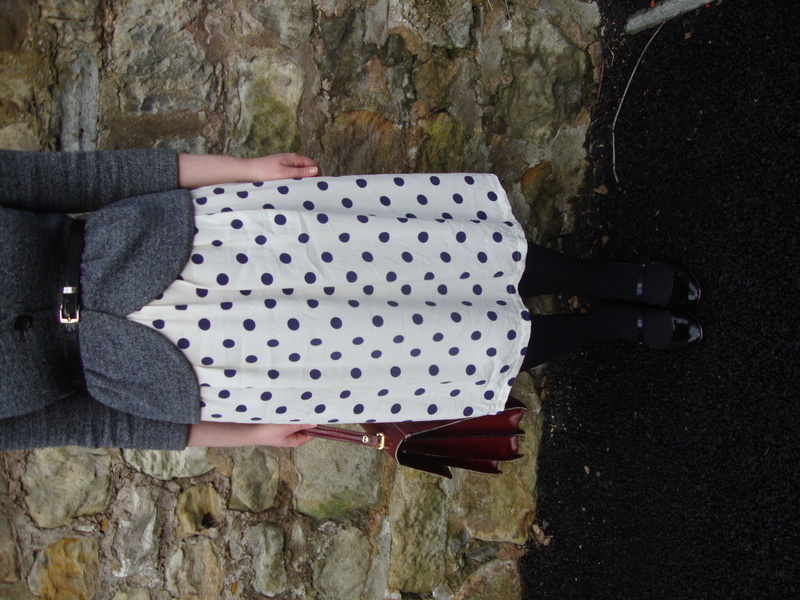 I’ve been dying for an excuse to wear it and thought it added an authentic twist to my retro-style ’40s-style polka dot tea dress from Topshop, fitted tweed peplum jacket from H&M and patent leather Mary Jane pumps from Office. I accessorised with bright red lips, my vintage patent leather belt and doctor’s bag and a faux fur tippet from Urban Outfitters to add that iconic ’40s polish to the look.